While analysts continue to predict great things for mobile entertainment, delegates at the recent Mobile Entertainment Market (MeM) conference in Monte Carlo were talking as much about barriers to explosive growth as they were about new developments in mobile content. The Mobile Games Manager from Slotland.com, a leading provider of real-money mobile casino games, attended the conference and reports that the concensus in Monaco was that if phone network providers loosened the reigns it would stimulate development and make more entertainment more available to mobile users. Phone companies, whose mobile portals are still the only significant source of mobile traffic, have a virtual monopoly on mobile content -- mostly because customers don’t know that they can venture off the phone company’s home page. And unfortunately, since mobile network operators take a much higher percentage of the profits than internet portals, most independent entertainment providers can’t get their product to players this way. However, just because the phone company isn’t offering mobile gambling doesn’t mean players don’t have access to real-money casino games on their mobile. Mobile surfers that leave the phone company’s portal soon find popular independent operators like Slotland.com. “Generally, mobile content market today is in a similar stage to where the internet was in the late 80s and early 90s when AOL, MSN and similar internet access providers thought that every internet visitor will access the web through their home portals, and no other pages, and every content provider would have to advertise and gain customers through their portals only,” observed Lancelet. Meanwhile, independent companies like Slotland.com continue to make fun mobile entertainment available. The long-popular slot machine and video poker web site has 5 real-money slots on their WAP site, wap.Slotland.com. 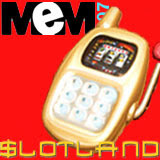 The mobile games are tied to Slotland’s famous online progressive jackpots, and players can use their Slotland.com player account on the computer or on the mobile phone.